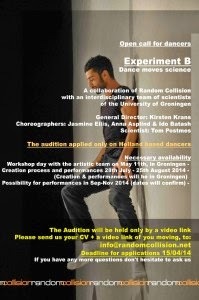 Random Collision is looking for dancers. The audition applies only to Dutch based dancers. The project is a collaboration of Random Collision with an interdisciplinary team of scientists of the University of Groningen. It will be created by three different choreographers.